The problem of creating microbiologically-safe food with an acceptable shelf-life and quality for the consumer is a constant challenge for the food industry. Microbial decontamination in the food industry provides a comprehensive guide to the decontamination problems faced by the industry, and the current and emerging methods being used to solve them. Part one deals with various food commodities such as fresh produce, meats, seafood, nuts, juices and dairy products, and provides background on contamination routes and outbreaks as well as proposed processing methods for each commodity. Part two goes on to review current and emerging non-chemical and non-thermal decontamination methods such as high hydrostatic pressure, pulsed electric fields, irradiation, power ultrasound and non-thermal plasma. Thermal methods such as microwave, radio-frequency and infrared heating and food surface pasteurization are also explored in detail. Chemical decontamination methods with ozone, chlorine dioxide, electrolyzed oxidizing water, organic acids and dense phase CO2 are discussed in part three. Finally, part four focuses on current and emerging packaging technologies and post-packaging decontamination. 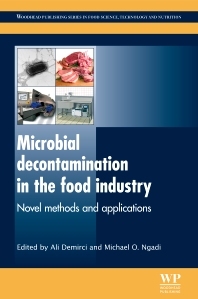 With its distinguished editors and international team of expert contributors, Microbial decontamination in the food industry is an indispensable guide for all food industry professionals involved in the design or use of novel food decontamination techniques, as well as any academics researching or teaching this important subject. Ali Demirci is Professor of Food Engineering in the Department of Agricultural and Biological Engineering at The Pennsylvania State University, USA. Michael O. Ngadi is Professor of Food Engineering in the Department of Bioresource Engineering at McGill University, Canada.